While Fiamma Breschi would have a hard time remembering Peter Collins in a different light, the majority of the Formula One world would easily recall the Brit from Kidderminster as a talented racing driver with an incredible talent. Unfortunately, as of the 3rd of August in 1958, all that anyone would have left of Collins would be those too few memories and a lot more questions. The 1958 Formula One season would be one of the darkest in the series' history and perhaps no death in a race would be as impactful, at least to that point in Formula One's history, as that which was experienced on the 3rd of August at the Nurburgring. Luigi Musso's death following the French Grand Prix would hit Peter Collins and Mon Ami Mate, Mike Hawthorn, quite hard. However, as the number two Ferrari Dino 246 kicked up on its nose and began to violently flip into the woods, perhaps no other accident would be so arresting as that which Collins experienced. It wouldn't just mean the death of Collins. It also meant the death of an unusually close friendship; a friendship born of speed and a love of life. Peter John Collins would be born November 6th, 1931 in the city of Kidderminster. To say that auto racing was in his blood would be to make some assumptions. However, to say that Peter would have a life in the automotive world would not. Born to Pat and Elaine Collins, some of Peter's first memories would be of his father's motor trade business. Being a rather important figure in the motor trade world, Pat's automotive interests would rub off on Collins from a very early age and it would lead to Peter working as an apprentice for Ford in Dagenham in his mid-teens. Being a motor trader, Pat Collins would have the means to support his son and he certainly had no trouble supplying gifts of an automotive nature. In fact, it would seem apparent that Pat Collins purchased a brand new 500 cc Cooper-Norton for his son as a 17th birthday present.Because of his father's interests in the motor world, Peter would have no trouble gaining encouragement to look into a career as a racing driver. Therefore, nearly every spare moment of Peter's life would include making trips to abandon airfields to train and hone his racing craft. The year was 1948. Collins would continue to train and train at airfields until the 1949 racing season started. At the age of just 18, Peter would make his debut at the Goodwood Easter Meeting racing his Cooper Mk II. Being young and inexperienced in motor racing results would be mixed early on. Quickly the present from his father would be replaced with a longer Mk III chassis. But this new car would do little to improve his results. All that would change come July. Collins was still in the middle of just his first year of motor racing when he made an appearance at Silverstone for his first 100 mile race. This dramatically-increased racing distance would bring Collins' talents to the fore as he would battle for the lead of the race throughout the first part of the race. He would then dominate over the remaining part of the race earning an important and quite revealing victory. Good results would continue to come Collins' way, including a victory in the September Goodwood meeting. Despite being in just his first year of motor racing, Peter's natural racing talent was more than obvious. Collins would continue to racing in the 500 series for another couple of seasons. This allowed his experience to grow, but it also allowed bigger teams to get a look at his talent. In 1951, he would win the SUNBAC race at Silverstone, and this would prove the final springboard into the higher formulas. Also in 1951, Collins had partnered with Lance Macklin and Stirling Moss to create one of the strongest driver lineups in any series. They would all be part of George Abecassis' and John Heath's HWM team in Formula 2. Collins would continue to impress and would lead to 1952 being a big year for the young man from Kidderminster.Toward the end of the 1951 season Collins would compete with an Allard J2 and would come away with a couple of victories. This would be enough for Reg Parnell to take it upon himself to mention to John Wyer at Aston Martin that he may just want to sign the young driver for the sports car team. Collins' major debut would come in sports cars and at one of the toughest venues in which to make a debut. 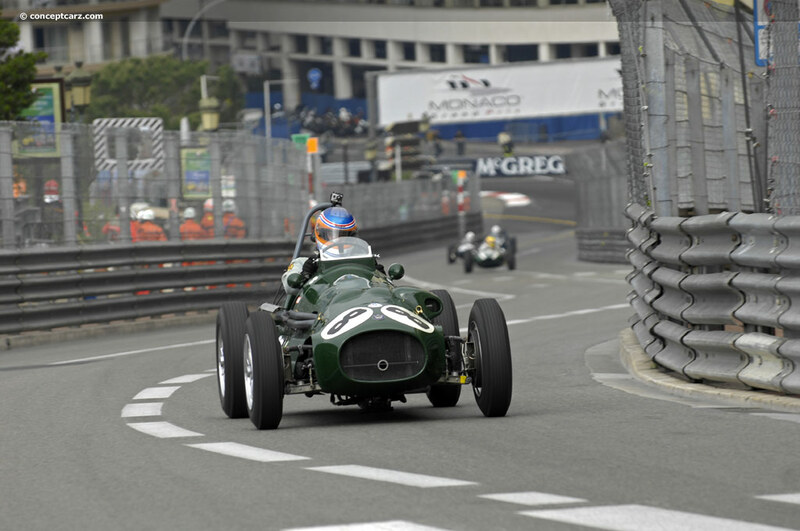 At the wheel of the number 74 Aston Martin DB3, Collins would be prepared to contest the Grand Prix de Monaco. 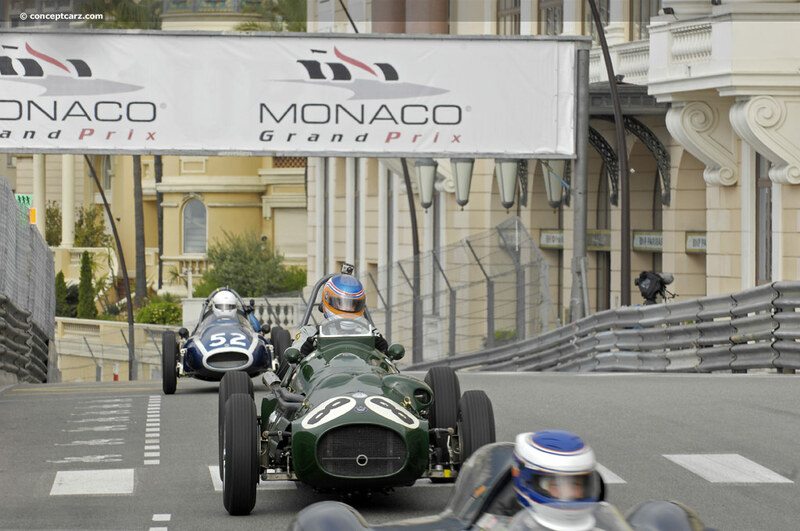 In spite of the imposing presence of the Monte Carlo street circuit, Peter would start from 12th on the grid and would drive a consist race to finish in 7th place. Just a month before the impressive debut with Aston Martin at Monaco, Collins would make a rather quiet Formula One debut with HWM Motors in the Swiss Grand Prix at Bremgarten in the middle of May. The first race of the Formula 2 era in Formula One, Peter would be impressive in qualifying ending up 6th on the timesheets and starting from the inside of the third row of the grid. 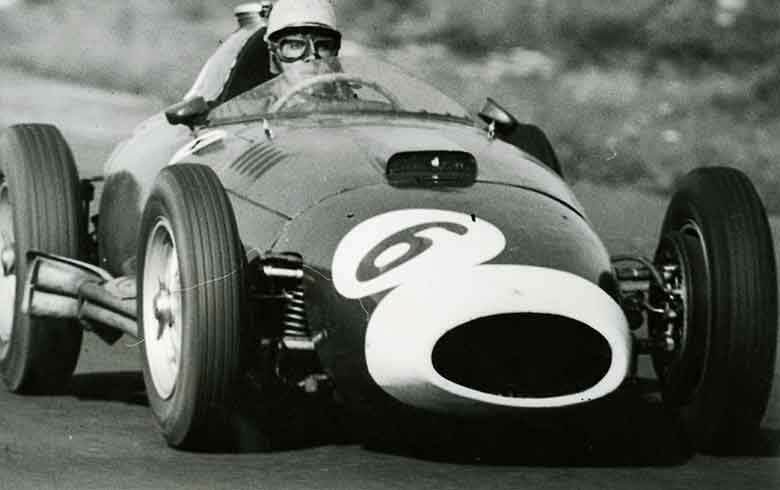 Having taken the seat left vacant by Stirling Moss, Peter would out-qualify Moss and HWM founder George Abecassis. Unfortunately, the race would not go well. Suffering a driveshaft failure after just 12 laps, Collins would crash out of the race suffering a retirement in his first World Championship event. It would merely be a sign of things to come as he would suffer two more retirements over the course of the season and would even fail to qualify for the Italian Grand Prix at the end. The one and only highlight for Peter in his first season in the World Championship would come at the French Grand Prix where he would finish a respectable 6th, missing out on his first World Championship points by just a couple of laps. While his first year in the World Championship was providing few, if any, highlights, his sports car talents were taking him to incredible heights right from the very beginning. In spite of failing to finish his first 24 Hours of Le Mans, Peter would go on to score victory in the Goodwood 9 Hour race in August of that year co-driving with Pat Griffith. That was it, Aston Martin and John Wyer were convinced of Collins' talents and he would remain with the team all the way up through the end of the 1955 season. The partnership would be a rather successful one in that Collins would earn a number of victories and strong results over the course of his time with Aston Martin. 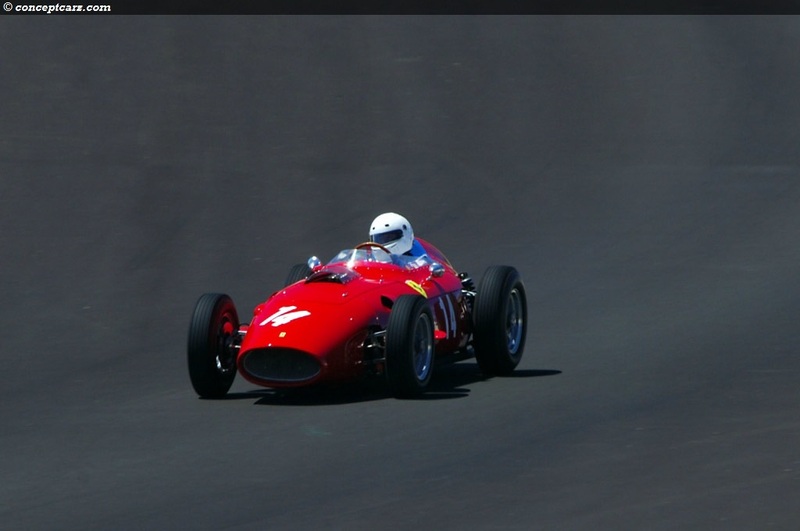 Some of those highlights would include 16th place finish in the Mille Miglia in 1953 at the age of just 20. He would then back-up his victory in the 1952 Goodwood 9 Hour race with a 2nd place the following year. Then there was the Tourist Trophy race at Dundrod in early September. Co-driving with Pat Griffith again, the number 20 Aston Martin DB3S would be powered to victory giving Collins his biggest victory to date. Collins' talents in sports car endurance racing were more than evident. Unfortunately, the poor reliability of the HWM would continue to let him down in the Formula One World Championship. 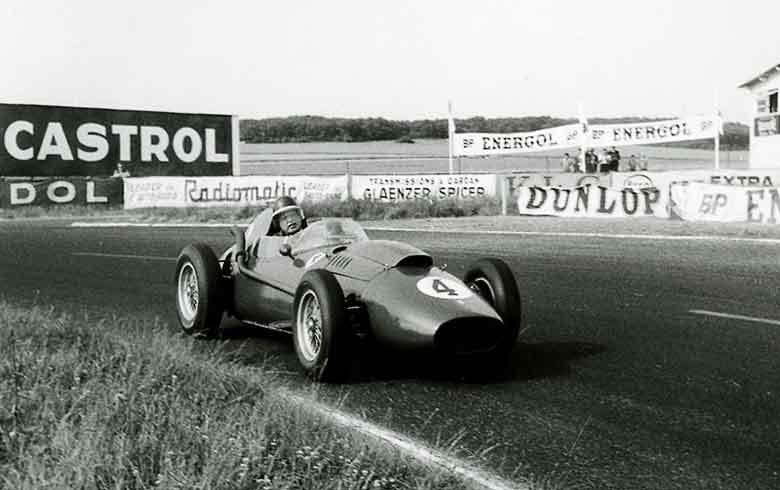 Throughout 1953, the two brightest spots of Collins' season would come in the Dutch and French grand prix where he would finish 8th and a lowly 13th respectively. There served as the two highlights on the season as they would be the only two races in which he managed to finish. Moving on to Vandervell's team and the Vanwall Special for 1954 little would improve. Taking part in just a couple of races for the team over the course of the season, he would finish just one. It would be a 7th place result at the Italian Grand Prix toward the end of the season.